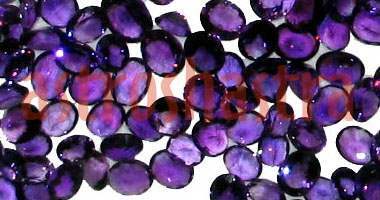 Amethyst Gemstone is a form of quartz, with a silicon dioxide composition. The majority of quartz samples are clear, but amethyst derives it's beautiful purple appearance due to small amounts of iron impurities in the crystal lattice. It is also used to pacify planet Saturn. It is also popular as an antidote for achohol Addiction. It is the semi precious stone and is used as a substitute of Blue Sapphire in Astrology. It is also considered as Mystical and Ayurvedic stone for Aquarians, Pisceans, Sagittarians . Wear energized gemstone on any rising moon Saturday as Saturn Remedy. 1. It is one of the best stones to use for meditation as it impacts Crown Chakra. You can use raw or polished stone by wearing while meditating or you can wear its Mala or Pendant around neck. 2. It is a stone of divine love. It guides the awareness away -from self-centered thought patterns as it lures the mind towards a deeper understanding. 3. It has calming mental effect, it is a stone that can be used for over- worked, over - stressed, or overwhelmed mental states, and it gives protection to those who wear it. 4. It is one of the best stones to use for tension or migraine headaches. 5. It's good for people who tend to be easily angered or suffer from recurrent nightmares. 6. It brings you a peaceful balance of mental and emotional energies. 7. A good stone for insomnia and intuitive awareness. 8. It will bring you mental peace and harmony. 9. It helps in overcoming addictions especially Alchol Addiction. It occurs in Africa, Australia, Russia, South America, Brazil, Uruguay.